I think I’m going with the 18.5”. 22 is just obscene when I’m cooking for two most of the time. I can cook a ton of food on the 18.5. I have a family of four, and never cook just a single meal on it. I pack my lunch, so extra birds go into the smoker, the meats gets pulled and we avoid buying lunch meat. same thing I do. I vac seal and freeze everything left over. Just heat and serve meals are awesome on the weekdays when you are just spent and don't want to have to cook. My favorite is the smoked pork shoulder. 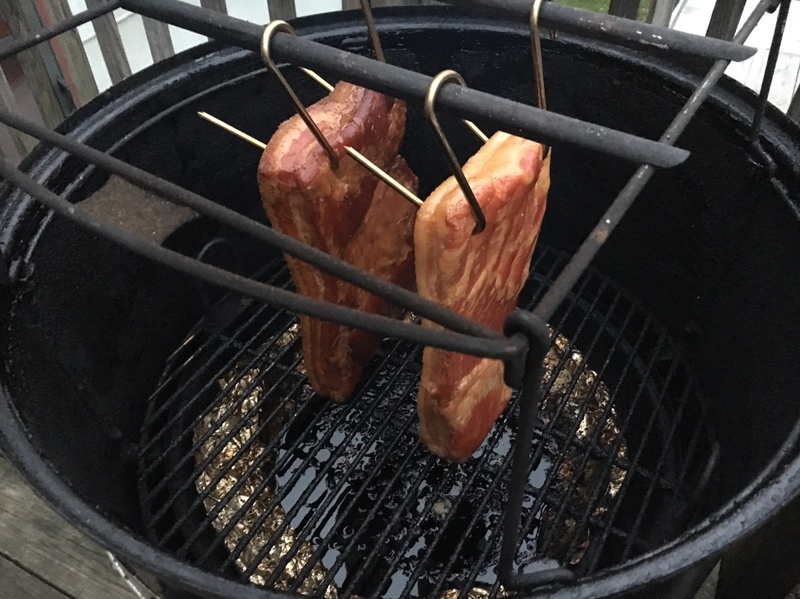 I usually do a two pack from costco its a full day of smoking but so worth it especially with the snake method on a 26" weber kettle. Yeah pork shoulder is the favorite around here too. Pro-tip: make your own Banh Mi sandwiches with the pork. So tasty! What is is your recipe for the 10 day cure? 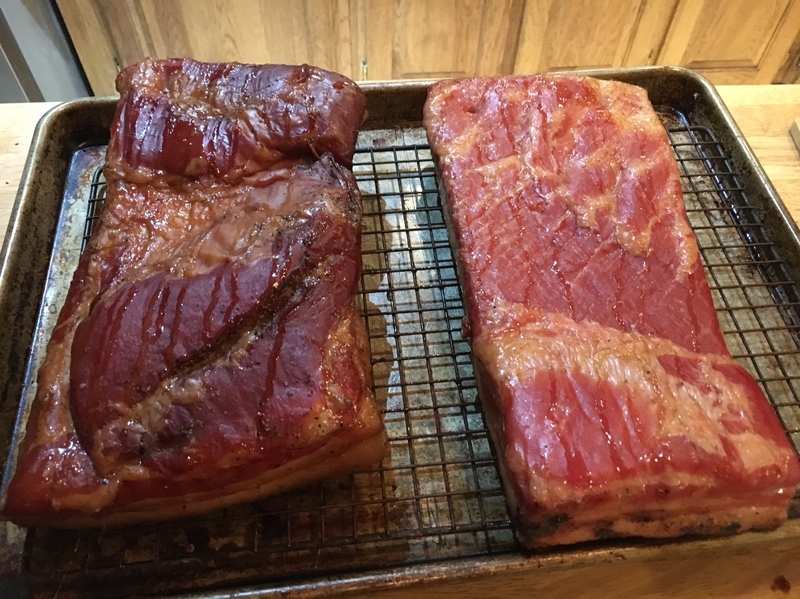 How long do u smoke the bacon? Thamks. Looks good I will try it! New toy. Couple of advantages. Weber manual thermometer was reading 205° on the lid while this was reading 255° on the lower rack. This made me think one of the two was way off, because the lid should be hotter. Stuck my thermapen through the top vent and got 275°! Probably would have never checked if I didn't buy this. Now I've got one probe monitoring the pit temp while the other is in my pork shoulder. Later in the day I'll add a rack of ribs and some wings. Ribs and pork shoulder have my rub, the wings will just get smoked before going in the fryer and then dosed with Jon's Korean sauce recipe. My ceramic grill is 18.5" by 25". 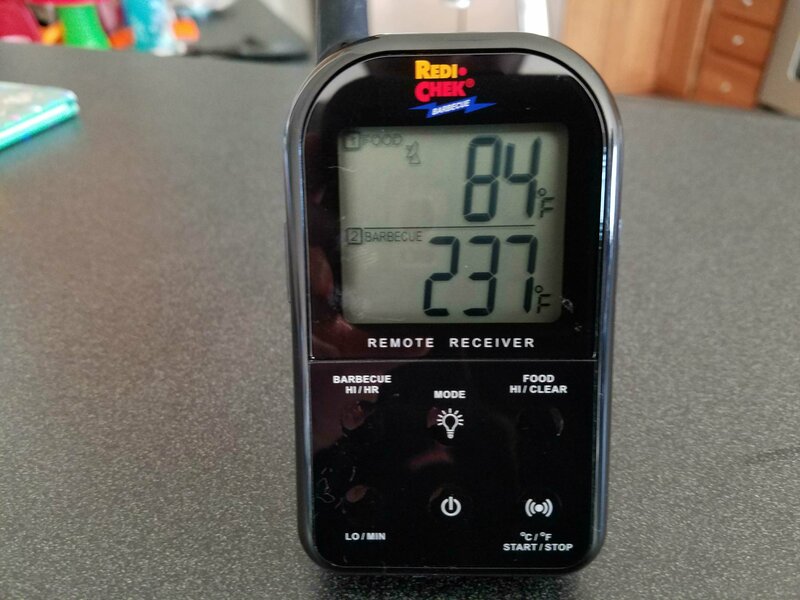 I can start the wood and charcoal, get the temperature set around 200-225, and not have to check the temperature for 6-8 hours at a time with this bad boy. 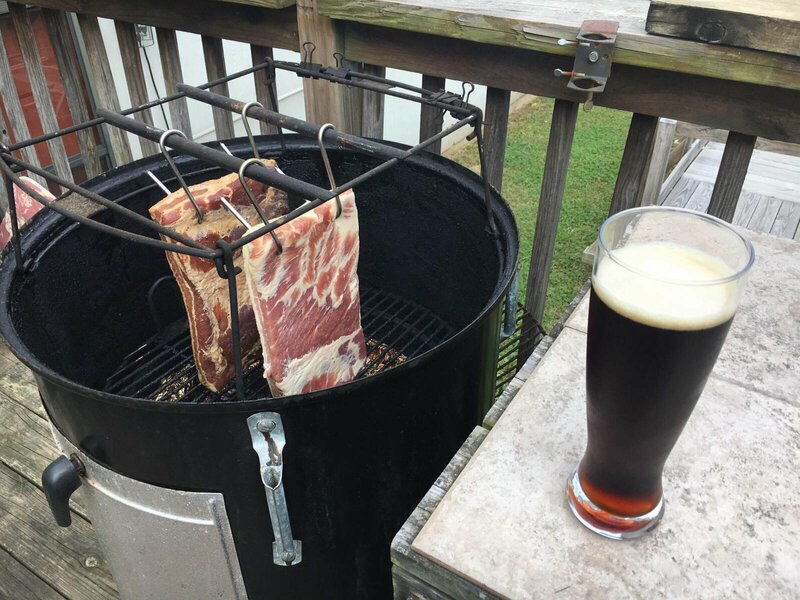 Hey Chumster: I would be interested in any more info that you could share about your grill. I'm looking at purchasing one of the kamado style cookers, they range from ~ $300 upwards of $2,000, and I've zeroed in on the Primo's as a potential candidate based on price and features. Could you give me any detail on the construction and/or customer service that you may have experienced? I've found a couple negative reviews on both: cracked ceramic, the run-around trying to get service, etc. Your experience would be appreciated. "The intriguing situation about brewing, on the other hand, is that mechanisms are theoretically possible, and the real key to success is the ability to identify those that are genuinely relevant in any particular situation." I am an advocate of the CharGriller Akorn. For $300 or less it should last for years if kept covered. Mine is about 6 years old now and I have not had any rust. 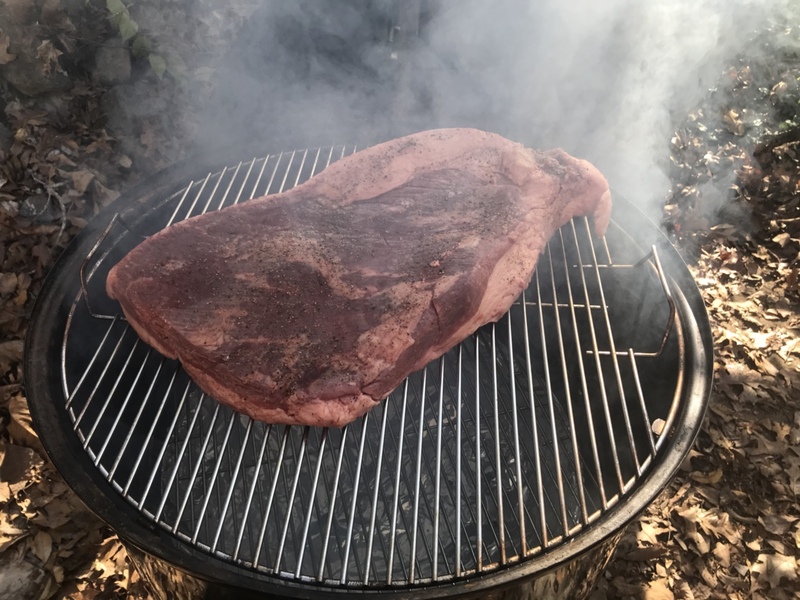 High heat brisket underway...Thanks for idea, Dwain. Hope you enjoy it as much and we do around here. It was awesome. 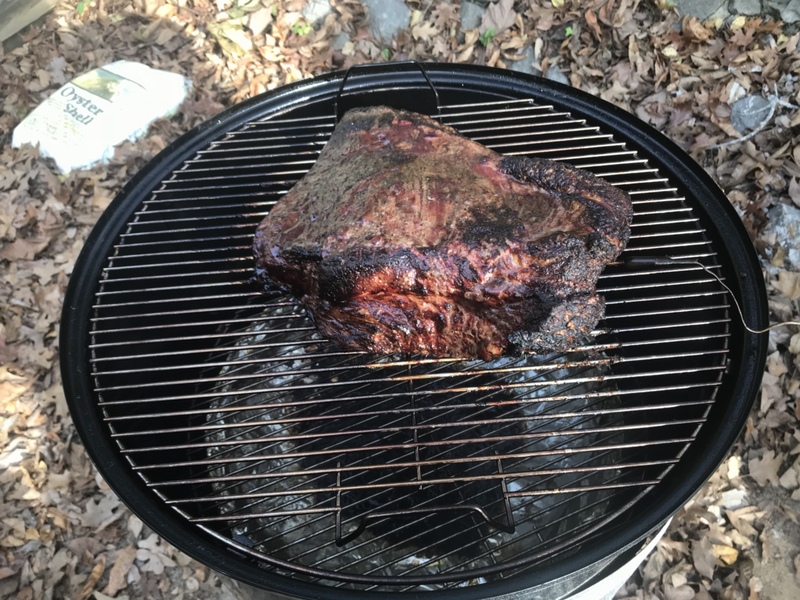 I cooked a 9# brisket from Costco. It was the smallest whole brisket they had. It got to 205F in 4 hours. I then rested it in a cooler for 2 hours while I cooked sides. I can’t imagine how the brisket would be better by cooking it slower. Exactly. You can’t beat it. Thanks for the reply, Mike, I've looked at the Akorn multiple times and I'm sure it would work fine. The negative reviews seem to revolve around the bottom rusting out, (those with pics appear to show people don't know to empty the ash pan after use), and the hardware pulling out, (be aware and don't drop the lid backwards without supporting). I would be interested in info on how long it holds temps. Chumley's report reflects others I've read online, that it's a "set it and forget it" as the ceramic allows temperatures to be maintained with little variance over a period of many hours. That's what has me interested in the Primo, plus it's the only model I've found that is made in the USA. And I'll go out of my way and spend more to support US manufacturing. Funny you should mention that. Mine did arrive with a cracked fire box. We called them up and they sent a new one promptly. They did a lousy job of packing it, I would have to say, though. Hopefully they have improved in the packaging after having to replace a few broken grills.